Get QuickLaunch for 50% Off - Just $2.50! 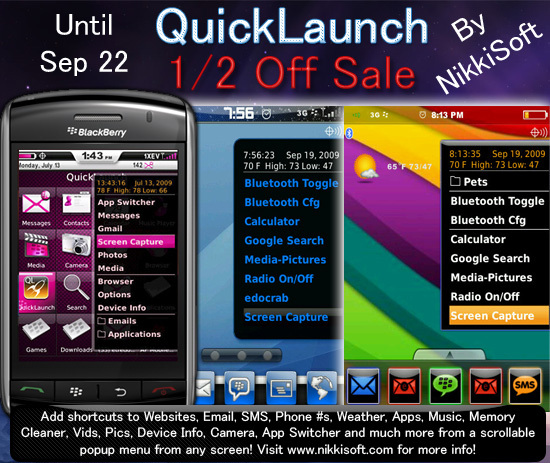 QuickLaunch is a must have application for every BlackBerry owner. With an interface that is seamlessly integrated with the look of the BlackBerry OS, QuickLaunch will create shortcuts to most any application on your device with ease and style. In addition the added functions included with QuickLaunch will enable you to delete several other apps on your device saving memory making QuickLaunch the 'Swiss Army Knife' of your Blackberry. Jump over the product page at the link below for more information, video overview, customer reviews and to purchase. You can also check out our CrackBerry review here.